Elendilion – Tolkienowski Serwis Informacyjny » Blog Archive » G-i-P Report: Sindarin runes on Orkrist’s scabbard! G-i-P Report: Sindarin runes on Orkrist’s scabbard! About the Sindarin/Angerthas inscription on Orkrist’s blade we’ve alredy written here. As Earl Carvalho reports, a TORn board member, Altariel Noldo, has spotted another runic inscription in Sindarin on Orkrist’s scabbard (as shown on a photo on the Weta Collectors Forum) – see the discussion on TORn board here. The photo is reproduced below. We should remember that the sword’s handle in the movie is made of dragon’s (literally lŷg ‘snake’) tooth. 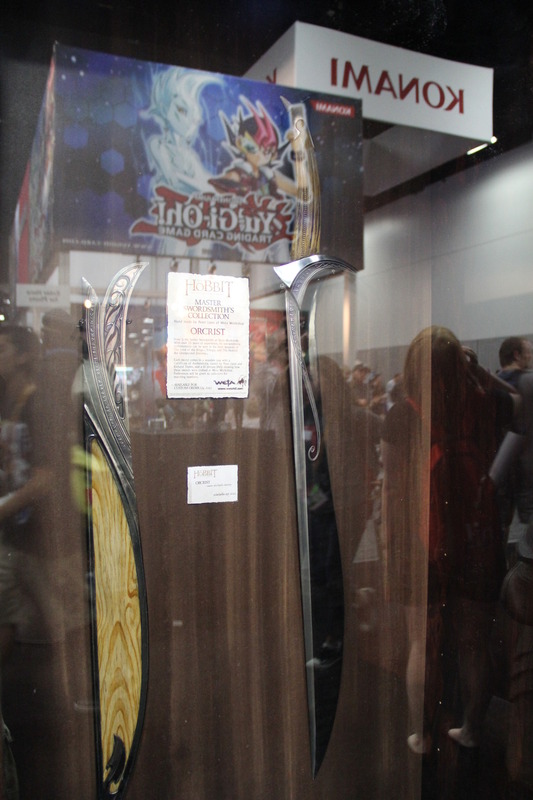 It seems that the scabbard is made of the same material. It gives more sense to the scabbard’s inscription. What do you think about our translation of the Orkrist’s scabbard runes? 8 Komentarzy do wpisu "G-i-P Report: Sindarin runes on Orkrist’s scabbard!" Well, given that runes 35 and 54 are somewhat interchangeable one might also read „sarn” and „huig”. Probably harn (or sarn) is in fact hern/sern. Do you have any theories concerning the rest of the inscription? The problem is madweg and soig. In my opinion both have something common with the stems for ‚eat’ and ‚drink’. The second of them is probably related to Quenya soica ‚thirsty’ (VT 39:11). Is it possible that madweg means ‚hungry’? Ui ni madweg a soig ‚Eternally I [am] hungry and thirsty’? Yeah, I have found madweg in the Parma Eldalamberon 17.! Oh, very nice! „Thirsty” would fit perfectly in context and apparent form (given SUK-, drink, of course). Though you seem to hesitate between „suig” and „soig”? To me it clearly reads „suig”, and even if the diphthong had been opened to „oi” at some point it should (at least according to VT/48:7) have become „ui” again by the Third Age (< *soikæ < *suika < *suk-jā). Thanks for your comment, Lothenon! soig was my error. I have changed it and now it should be ok.
And what you think about the first part of the sentence? Maybe it should rather be something about a dragon’s tooth driven under compulsion, impelled from its mouth?